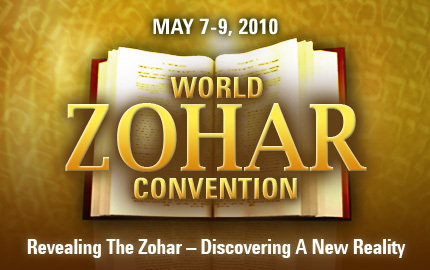 The Zohar holds the key to discovering the complete, eternal reality, where humanity is united in perfect harmony as one soul, in the shortest time possible. The World ZoharConvention is aimed at giving its participants a taste of this reality, and by doing so, accelerating everyone’s advancement toward it. There is a tremendous difference in whether I read these words from a prayer book, or something happens inside of me that causes an explosion from within, an outburst toward the Creator. The feelings form inside of me, and they build into the words and phrases. I may not even know this language. I don’t know how it happens, but it is the consequence of my effort to equalize my desires with the Light and unite with It. The reaction of the Light and the desires occurs in the soul. These words are realized in my brain, the brain transmits the orders to the organs of speech, and I utter the words without knowing where they came from. This is what true prayer should be like, when everything comes from within. From the union of the Lights and the Kelim inside the depth of creation, gradually with the fulfillment of the desire by the Light, the whole TANTA (a full Kli – Taamim, Nekudot, Tagin, Otiot) is built, until it reaches an expression through the organs of speech. However, the sages of the Great Assembly (Anshei Kneset Agdola) were aware of the imminent descent into egoism and concealment of the Creator. Thus they gathered a collection of prayers – states that a person needs to reach. They called it “Siddur,” the order of spiritual states that we need to go through inside, in our hearts, in our desires. But since we are incapable of doing this during the exile, without a connection to the Light or the Creator, while the Upper Force is concealed, we read the words from a prayer book mechanically. Some people try to imagine what it could mean spiritually. Yet only while studying Kabbalah will the Light provoke the feelings, thoughts, sensations, words, and phrases of our prayer inside us, as work in the heart, rather than work in the organs of speech. A question I received: How can we imagine human life in the spiritual world, completely devoid of suffering? My Answer: We are unable to picture this since anything that we would imagine would be egoistic. The notion of the spiritual world is finding pleasure and inspiration in bestowal, in love for the others. However, it’s not for personal pleasure or inner peace, but for the greatness of the action itself. So how can I feel the greatness of bestowal? I plead that the Light will let me feel it since I am incapable of doing it myself. However, I am even incapable of wanting it and asking for it. So what do I do? The environment can compel me to do this; it can force me to have a desire for something that is unnatural and generally opposite to me. The environment can oblige a person to do anything. A person is even ready to commit suicide in order to look great in the eyes of the others. Everything depends on the environment. It can instill desires that are against a person’s ego, and his ego will go along with it. This is due to the fact that the human degree within us is higher than the animal degree, and in order to achieve one’s desire on the human degree, to satisfy one’s ambition, a person is willing to kill the animal in him. An animal is incapable of this, yet man is. It’s because within him, there is a human degree upon which influence can be exerted. It is completely dependent on the environment. The environment needs to influence each person in such a way that he will desire to ascend above his egoism. By influencing each other in this manner, they both will ascend constantly.